Brushing and flossing are the best ways to help prevent cavities, but it’s not always easy to clean every nook and cranny of your teeth – especially those back teeth you use to chew (called molars). Molars are rough, uneven and a favorite place for leftover food and cavity-causing bacteria to hide. Still, there’s another safety net to help keep those teeth clean. It’s called a sealant, and it is a thin, protective coating (made from plastic or other dental materials) that adheres to the chewing surface of your back teeth. They’re no substitute for brushing and flossing, but they can keep cavities from forming and may even stop early stages of decay from becoming a full-blown cavity. In fact, sealants have been shown to reduce the risk of decay by nearly 80% in molars. This is especially important when it comes to your child's dental health. In October 2016, the Centers for Disease Control released a report on the importance of sealants for school-aged children, of which only 43% of children ages 6-11 have. According to the CDC, "school-age children without sealants have almost three times more cavities than children with sealants." You may have many questions about sealants, and we have answers for you below. Read on to learn more about sealing out tooth decay. Think of them as raincoats for your teeth. When the cavity-causing bacteria that live in everyone’s mouth meet leftover food particles, they produce acids that can create holes in teeth. These holes are cavities. After sealant has been applied it keeps those bits of food out and stops bacteria and acid from settling on your teeth—just like a raincoat keeps you clean and dry during a storm. Children and adults can benefit from sealants, but the earlier you get them, the better. Your first molars appear around age 6, and second molars break through around age 12. Sealing these teeth as soon as they come through can keep them cavity-free from the start, which helps save time and money in the long run. Ask your dentist if sealants are a good option for you and your family. It’s a quick and painless process. Your dentist will clean and dry your tooth before placing an acidic gel on your teeth. This gel roughs up your tooth surface so a strong bond will form between your tooth and the sealant. After a few seconds, your dentist will rinse off the gel and dry your tooth once again before applying the sealant onto the grooves of your tooth. Your dentist will then use a special blue light to harden the sealant. Can Sealants Be Placed Over Cavities? Sealants can be used over areas of early decay to prevent further damage to your tooth. Because some sealants are clear, your dentist can keep an eye on the tooth to make sure the sealant is doing its job. With the exception of an allergy that may exist, there are no known side effects from sealants. 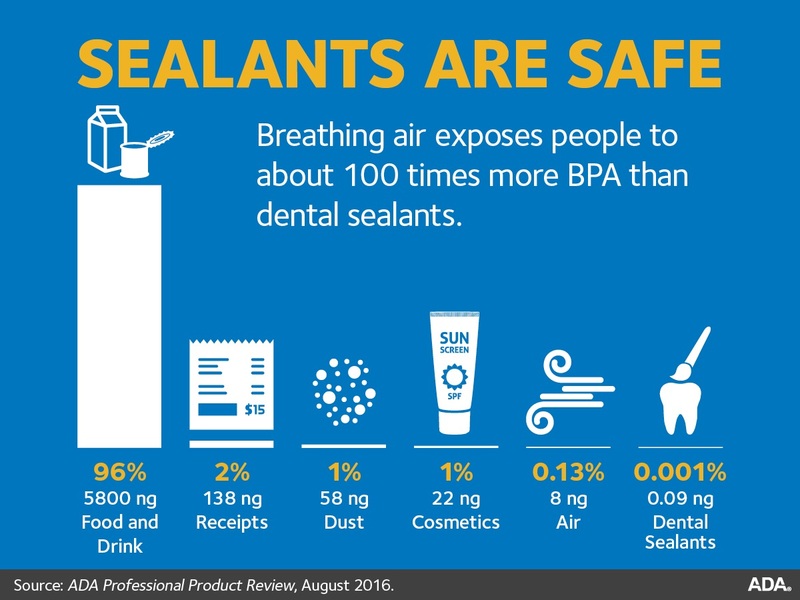 Yes, there is a tiny amount of BPA in sealants but not enough to cause you or a loved one any harm. In fact, you get more exposure to BPA by simply touching a receipt, using cosmetics or coming in contact with dust. Sealants will often last for several years before they need to be reapplied. During your regular dental visit, your dentist will check the condition of the sealant and can reapply them as needed. Are Sealants Covered By Dental Plans? Some plans do cover sealants, so call your dental benefit company to find out what kind of coverage you have. Take our MouthHealthy Quiz on Sealants to learn more!